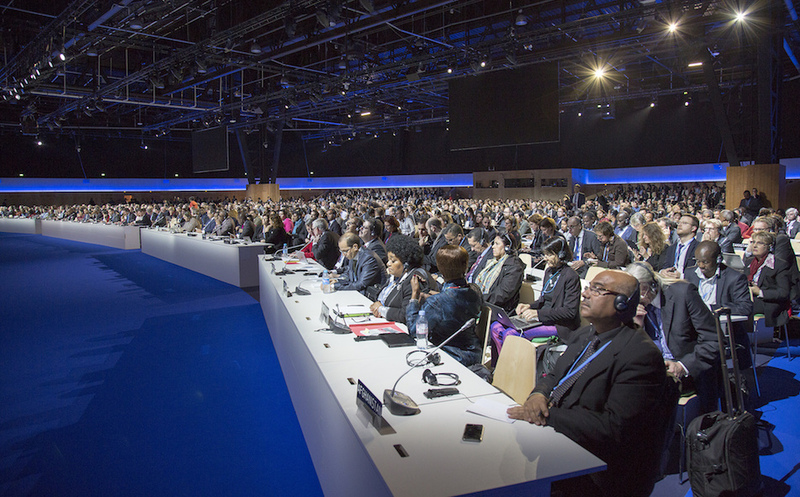 Delegates from nearly 200 nations met in Paris for a historic climate conference. Texas Climate News asked Bernhard Poetter, a German journalist who covered the recent climate conference in Paris, to provide this exclusive analytical appraisal of the U.S. role in the talks and how it was viewed by others. He describes, as he put it, “how the U.S. delegation at the climate talks got its groove back. And where they put on the brakes.” Nearly 200 countries reached a historic agreement at the conference to reduce global warming pollution by enough to hold the earth’s average temperature increase to “well below 2 degrees C,” or 3.6 F. The aim: avert the most devastating effects of climate change. Poetter, 50, is a senior editor for environment, energy and climate with the daily newspaper Die Tageszeitung in Berlin. He has been reporting on environment and climate issues for more than 20 years and is a regular observer of the “conferences of the parties,” or COPs – U.N.-sponsored climate negotiating sessions like the one in Paris. The Paris conference was COP 21. Poetter has authored several books on the German Energy Transition, or “Energiewende” (Germany’s shift to renewables and more conservation), and on international climate policy. He holds a master’s degree from the Free University Berlin in American Studies, Political Science and Law. In the spring of 2015, Poetter spent three weeks in the United States for an extended research project on energy policy, including a week in Texas. In a lucky coincidence, he got to visit his oldest son for a weekend who was attending school for an international year in Bryan. Many people, many delegations and many countries have come a long way since that U.N. climate summit, which failed so miserably. Copenhagen ended in a minimal compromise to disguise the utter failure of the countries to come together on climate change. The “Copenhagen Accord”, pushed by President Barack Obama and nailed together with the Chinese leadership in a last-ditch, behind-the-scenes move, left only one alternative to all the other countries: Do or die. With grinding teeth, they accepted the weak paper in the Danish capital and came on board. What a difference in Paris. When the tumult subsides, Fabius opens the floor for speeches. Secretary of State John Kerry, speaking from the U.S. delegation in the room – not from the rostrum – welcomes the agreement. The weathered climate politician spent the second and vital week of the negotiations in Paris – a commitment by the Obama administration and by Kerry personally to the cause. Just three days before, Kerry gave a speech outlining the ambition of the U.S. for a strong agreement, calling on all parties to move beyond their “red lines,” the boundaries between what they will and won’t accept. He echoed Obama´s views from Day One of the conference. Then, the U.S. president had said, recalling the words of Washington State Gov. Jay Inslee, “We are the first generation to feel the impact of climate change, and the last generation that can do something about it.” Obama pleaded for a “long-term strategy that gives the world confidence in a low-carbon future.” And he was admonishing his own staff, but also all the delegates, when he said, “Let´s get to work”. And get to work they did. With Paris, the U.S. is back on the climate issue’s center stage. After the frustrating years of the Bush administration, the country is seen by many observers in other nations as being on track again – at least counting the current White House policy. It was in the Bali climate conference in 2007 when the U.S. delegation was openly asked “to step aside if you want to stand in the way,” and it was in the years after Bali that climate activists branded T-shirts with a saying from the Bali conference: “What are we going to do about the United States?” Now, Kerry aligned himself two days before the end of the Paris conference with the “High Ambition Coalition” – a loose union of more than 100 countries, forged by Tony de Brum, foreign affairs minister of the Marshall Islands, to bring about a good and binding agreement. Its members come from all parts of the world, ready to see action against climate change: small island states, vulnerable countries from Africa, the Caribbean and the Pacific, but also middleweight champions like Mexico, the Philippines and Colombia, all the way up to the big polluters – the U.S, the European Union. Plus, a surprise High Ambition member – Brazil, which had traditionally been one of the BRICS, the Brazil, Russia, India, China and South Africa big guys in the developing world, with huge and growing greenhouse-gas emissions. Obama´s seriousness on climate is widely recognized by other nations. The Environmental Protection Agency’s Clean Power Plan to shift the U.S. away from coal-powered electricity, the fuel-efficiency standards for the U.S. vehicle fleet, the veto of the Keystone XL pipeline, the progress in renewable energy in Texas, California and elsewhere, are well known and received among the U.N. states and the nongovernmental organizations who lobby government climate negotiators. Of course, the “skeptics” came to Paris, too. But the Heartland Institute from Chicago never made it to the conference for an event – they stayed in a hotel downtown for a press conference where they “grimaced at questions criticizing their denial of climate change,” and “journalists were mocked” and later thrown out, the news service Climate Home reported. In the conference venue, the U.S. presented its views in a large pavillion, bringing together descriptions of climate action by states, the work of federal agencies like E.P.A. and a display of science such as a huge globe of the world. Meanwhile, the U.S. delegation worked the aisles and backrooms like all the other parties to see a desired outcome. Outreach was especially strong to India and China. And it was with China that some observers feared a “G-2” accord might be struck – if all else failed, the Copenhagen modus would kick in, some argued: The U.S. and China, together responsible for some 40 percent of global greenhouse-gas emissions, would make a deal. There was a template for this: In the fall of 2014, the two big guys had declared their own pre-Paris agreement to cut greenhouse gases by about 27 percent by 2025 (the U.S.) and to peak emissions before 2030 (China) – taking into account the huge responsibility for climate change from historic U.S. emissions and China’s huge responsibility for future emissions. Trust and ambition were high enough among all 195 countries for a general agreement, so the G-2 deal did not have to be repeated. But there was one big dark cloud from Washington hanging over the conference: The stubborn resistance by the Republican-controlled U.S. Congress to anything resembling a legally binding treaty. So the Paris agreement is tailored very carefully around this question: Obama, it was planned, will be able to approve the agreement with his executive powers without having to go to the Senate for ratification. The U.S. also put on the brakes when it came to financial issues: The agreement’s language on the $100 billion annually that the industrialized countries promised in Copenhagen to poor countries for climate-adaptation measures and clean energy development had to be moved from the legally more binding part of the text to the less binding “decision” section. And the U.S., along with other nations that make up the Organization for Economic Cooperation and Development, successfully fought tooth and nail for a passage in the text that excludes any liability for the O.E.C.D.’s industrialized countries for “loss and damage” sustained by poor countries from climate change. “That is an absolute no-go for us”, a U.S. diplomat said. America, the “greatest country in the world” as some of its citizens like to advertise it, let only one nation shame it at the summit: its neighbors. The United States’ dear northern friends in Canada had sent delegates to Paris representing a brand new Liberal Party government after years of fossil fuels riding high under the former Conservative Party prime minister Stephen Harper. The new Canadian minister for environment and climate change, Catherine McKenna, proudly proclaimed that “Canada is back!” as a strong supporter of climate action. But McKenna had a problem – the Paris conference started so soon after the national election that brought new Prime Minister Justin Trudeau to office in November, she had to defend the old emission-reduction plans submitted by the defeated Conservative government. To ease this pain, the new Canadian administration coughed up a pledge to the U.N. Green Climate Fund of 2.65 billion Canadian dollars – about $1.92 billion in U.S. currency. The U.S. – a country of more than nine times as many people as Canada (320 million compared to 35 million) – last year had agreed it would contribute $3 billion to the fund, about 56 percent more than Canada’s new pledge. The fund will help developing countries lower carbon pollution and build resilience to climate change.